Want to know a secret? We've been lying to you for months now. Everyone has. 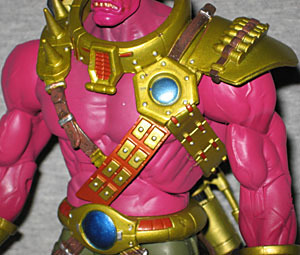 We keep saying that the DC Universe 4 Build-A-Figure is Despero. But it's not. After being defeated several times by the Justice League and even reverted to infancy, the mighty Despero returned looking for revenge. As he tore through every hero who tried to stand in his way, and even the bounty hunter Lobo, who had been hired to bring him in, it fell to the alien Kilowog to save the day. Using his Green Lantern ring to help him cobble together a special device, Kilowog impressed the bio-electrical matrix of the robot L-Ron upon Despero's synaptic patterns - effectively overwriting the monster's mind and leaving the droid in command. Yep, all appearances to the contrary, this isn't Despero at all - it's the mind of the little robot L-Ron inside Despero's body. Specifically, it's "Despe-Ron" as he appeared in Justice League Task Force, which means that not only isn't he Despero, he's not even a villain! Superhero, all the way! Eventually, Despero and L-Ron reverted to their own bodies, but this version? Clearly not Despero. Sorry for misleading you through so many reviews. Our bad. 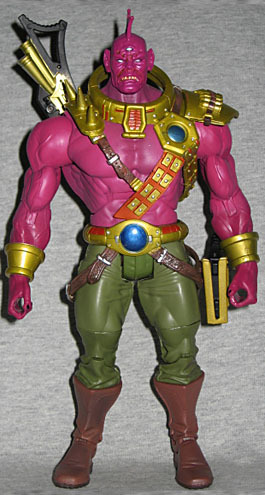 Despero has had an action figure before - and not just the big brute Despero, this verison of Despero. 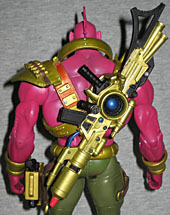 He showed up in the late-90s "Total Justice" line from Kenner, which was notable for its extreme poses, its minimal articulation, and doing its damnedest to give fan current versions of the characters. That's the first place we got an Electric Superman figure, and so far the only place there's ever been a Connor Hawke Green Arrow, so it made sense the version of Despero who was in the comics at the time got the same treatment. This figure, of course, comes in sections: legs, arms, and trunk, with all the accessories included with the torso. Geting the legs in place under the beltis kind of a pain, but stick with it, and you'll get them eventually. Counting the fin on his head, Despero stands 8¼" tall, which is okay - he's one of those characters whose size has never really been consistent, other than "big," so he's surely been drawn this big sometime before. They could have gotten away with a smaller figure, though, which would also have taken care of those people who just won't shut up about Lobo being too tall and how the've been cheated. 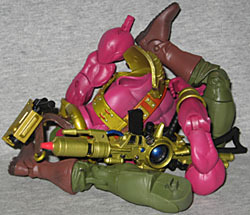 Despero features the standard DCUC articulation: a balljointed neck, balljointed shoulders, hinges at the knees, elbows, ankles and abdomen, and swivels as the biceps, wrists, thighs, boots, and waist. Due to the material used for his belt, the waist wants to stick at first, but the joint is definitely there. 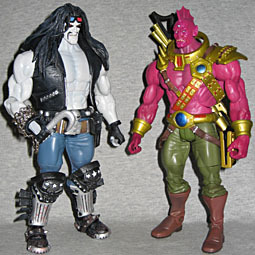 Without a leather vest on, Despero doesn't share Lobo's problem of looking like he's got tiny T-Rex arms. He's proportioned decently, and though his clothes are quite plain and unremarkable, the detailing on his armor is excellent. It's oh-so-very '90s, with the spikes and straps and a line of bullets on the shoulder pad, but it's true to the comics' design. A lot of care went into making the toy's armor, and it looks great. The armor is golden, with accents in silver and bronze, plus a bit of blue. It all stands out well from his olive pants and magenta skin. His boots are a flat brown, with dark soles. His eyes - all three of them - are pure white, with a black outline; I think it's just artistic license, not an indication that he's wearing mascara. His jagged fangs are a bit dirty, making them look like real teeth, and there are a few soft shadows painted on the body. There are also shaodws painted in pure red on his face, but they only show up under the light of a flash (we corrected these photos so you can see what the toy actually looks like in person). Like we said, Despero gets a few accessories. 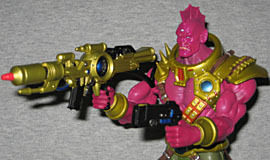 Since this was his Cable/Bishop phase, the accessories are guns. Big guns. Silly guns. Guns taken directly from the comics, just like the armor is. Okay, maybe it's not based precisely on any specific panel, but it's bloody well close, isn't it? There's a black pistol slung from his hip, and a mighty rifle across his back. They both work a lot better for Despero L-Ron than they did for Lobo. When Mattel started the DC Universe line, there were severe distribution problem. Series 1 was okay, but Series 2, Series 3? Yeah, right. You didn't grab 'em the first time you saw them, you were off to eBay to pay double. Series 4, however, has been plentiful and constant since it came out eight months ago, which could be either good or bad: good if it means stores ordered enough, bad if it means no one's buying them. Could go either way. But still, the fact remains, DCU4 was the first (and let's be honest, so far "only") series that was easy to find - odds are you could walk into Target today and build a full Despero, no problems. And considering the general quality of both the figures in the series and the "Deper-Ron" Build-A-Figure, that isn't a bad idea. Run out today and get your own set!